"Should I buy remy hair weave?" The short answer is if 100% remy hair weave would make you feel more comfortable and confident - then yes. As remy weave hair is available in the exact same hair weave textures as non-remy weave hair extension, you have the full complement of colours and textures available. There's a lot to be said for remy weave hair and even more to be said about remy hair in general but we'll get to that another time. To remy or not to remy is a common question and so we'll perambulate through the merits of remy weave hair and leave the (frequently unmentioned) merits of non-remy weave hair to another article. Remis hair is about cuticles and the direction in which they point. 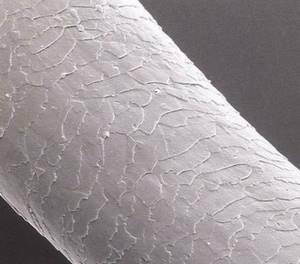 All human hair has cuticles that face away from the roots. Remis hair has all cuticles intact and running in the same (downward) direction. Why the different spelling of remy? Good question: The term remis came about during 18th century in the wig making industry. The spelling of remy was originally (and still is) remis but there are now accepted variations such as remy and remi. The word remis (remy or remi if you prefer) is the past participle of the French verb remettre and means "re-put" or "put back". When wigs were being made it was important that the donor hair was put back into the same direction it was before being cut - roots at the top and tips at the...well... tips (end). Remy hair has all cuticles intact and running in the same (downward) direction and because of this, it tangles in the exactly same way that growth hair tangles. Hmm... What does this mean? It means that remy hair has less of a tendency to tangle than non-remy weave hair. Remy hair is not tangle-free hair; it can tangle and it does tangle, just like growth hair tangles. It may be more helpful to think of remy hair as potentially having a lower tangle rate than non-remy hair; but it isn't tangle-free. "How do I care for remy hair weave?" If you have sewn-in remy hair weave extensions then the care guidance found sew in hair weave guide can be followed and the SLS and SLEs free shampoo should be formulated for coloured or chemically treated hair. When washing the sewn-in remy hair weave, always detangle hair with fingers first, starting at the ends of the hair and working upwards and avoid pulling or tugging as the hair weave is sewn into your own hair and you don't want to damage your own growth hair. If you have glue in hair extensions, then follow the guide for cleaning glue-in hair extensions. Keep the hair moisturised daily with oil free sprays or moisturizers without mineral oils. There are plenty of plant-derived oils for hair that will help nourish and strengthen the hair. Well pasta and bagels! It looks like we've come to the end of the remy hair weave road, but there's more information in the Hair Extension Q&A section as well as the navigation menu. If you'd like to be first to read new guides and articles about lace wigs, hair extensions and hairpieces, join our blog - it's easy to do and doesn't require any personal info!